Tested only in Daz Studio Pro 4.9 64 bit. 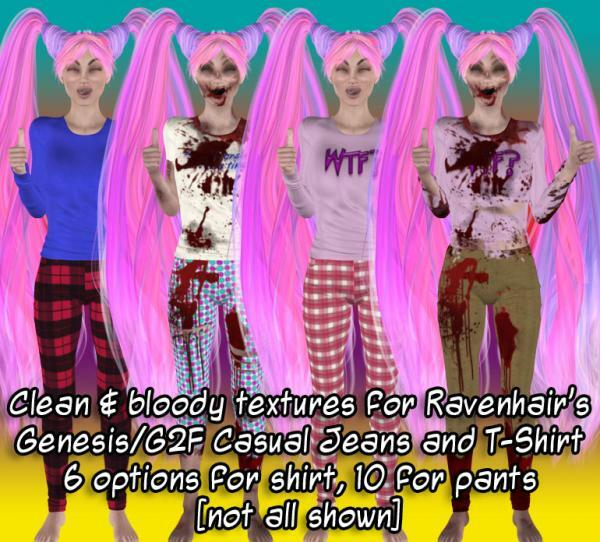 This package includes 6 3Delight textures for the shirt and 10 textures for the pants in Ravenhair's Casual Jeans and T-Shirt for Genesis and G2F [http://www.daz3d.com/casual-jeans-and-t-shirt-for-genesis-2-female-s]. There are 3 shirt textures and 5 pants textures that are clean, as well as 3 bloody shirt textures and 5 bloody pants textures. All textures will work on both the Genesis and the G2F versions of this outfit. After installation, find the material presets in My Library/People/Genesis/Clothing/G1CasualJeans/AltInclTorn&Bloody-by-ModernWizard and Library/People/Genesis 2 Female/Clothing/CasualJeans/AltInclTorn&Bloody-by-ModernWizard. This freebie is modeled by Valoria, a character by Demonica Evilius and Silver http://www.daz3d.com/valoria-for-arabella-7. I dialed her in on the Genesis 3 Female base and reduced her breast size. Use for whatever purposes you like, commercial or non-commercial. Attribution is always nice, but not necessary. Just don't repackage and call your own. Have fun!